Unable to find a paint that you used to use? Has something been discontinued? Want to find the equivalent paint in a different range? Here is the ultimate painting matrix, comparing the games workshop Citadel paints with every known equivalent. Please note, hex codes are all approximate - double check before you get a batch of paint made up to match that colour! http://www.wargamesfoundry.com - also do a range of similar to Citadel paints, will update when can get chance. 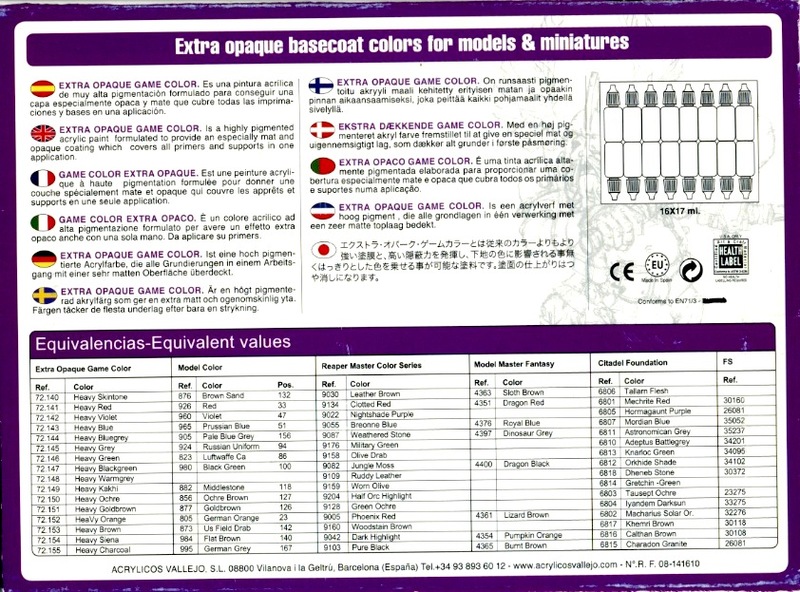 http://cdn.acrylicosvallejo.com/0049261608364909a238add9b4a53745/CC073-rev05.pdf has an equivalency chart for Vallejo Game Colour, Vallejo Model Colour and Reaper Master Series paints to the new Citadel paint line.